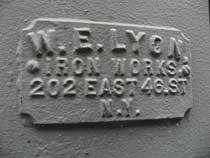 The original W. E. Lyon was William Edwin Lyon, a native New Yorker, born 8 Feb. 1824. He is recorded in the three successive U. S. Census reports of 1860, 1870 and 1880, and he died between 1896 and 1900 in Mamaroneck, Westchester County, N. Y. In the 1900 census his widow, Jane Lyon (née Sloat), lived on Hawthorne Park, Mamaroneck, Westchester County, N. Y., and the owner of W. E. Lyon Iron Works was his son, William Edwin Lyon, Jr. (1863-1949). William E. Lyon, Jr., was a one-time mayor of Mamaroneck, N.Y. (elected April, 1930). His marriage to Emma Kitty Newcomb of Mamaroneck was announced in the New York Times 27 Feb. 1896, p. 2. 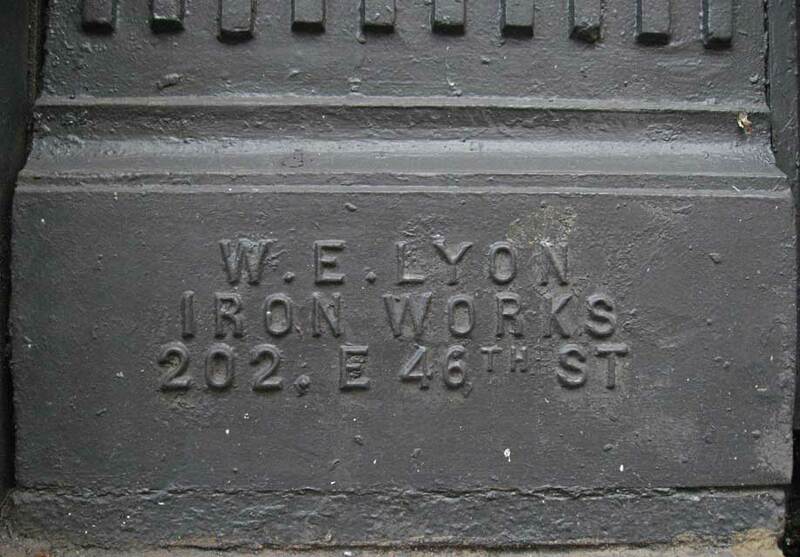 The Lyon Iron Works were located at 202 East 46th Street, Manhattan. This was the address of the company from approximately 1871 to 1931. Trow's New York City Directory for 1870 lists the only exception to this address: 216 East 38th St. The Lyon families lived in Mamaroneck, N. Y. from 1870 into the 1930s. 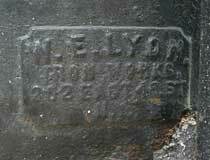 In addition to William E. Lyon, Jr., two of his brothers also worked for the foundry: W. Irving Lyon (1868-?) and James N. Lyon (1870-?). The 1860 U. S. Census (non-population schedules for manufacturers) recorded Wm. E. Lyon, Iron Rails. The company owned $3500 of real capital and raw materials consisting of 25 tons of bar iron ($1600), an unknown amount of paint ($500), and 20 tons of coal ($120). They employed an average of 10 laborers at a monthly cost of $300. In the year preceding 1 June 1860 production equaled 25 tons of railings valued at $45,000. This seems rather a neat profit. One suspects the $45,000 is an error. In the 1880 census Wm Lyons [sic], Iron Railings owned $1200 capital, employed an average of 6 laborers, and had an annual labor cost of $4744. They paid $2.35 a day for skilled mechanics and $1.00 a day for ordinary laborers. The value of their production in the preceding year was $10,344. The following notice appeared in the New York Times (1 June 1949, p. 32), "William E. Lyon Jr. of 106 West Forty-seventh Street, retired structural steel contractor and former Mayor of Mamaroneck, N. Y., died yesterday in the Francis Schervier Hospital in the Bronx. His age was 86. Mr. Lyon, who installed the framework of several large buildings in New York and Westchester County, was a founder and the first secretary of the Iron League of New York. He was a life member and former worker at the Henry Street Settlement, and in the first World War helped to arrange memorial services at Madison Square Garden." 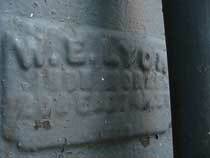 W. E. Lyon Iron Works also manufactured frames for vault lights. See the Tice & Jacobs vault lights page. W. E. Lyon vault lights are also located on Columbus Ave. near 72nd St.